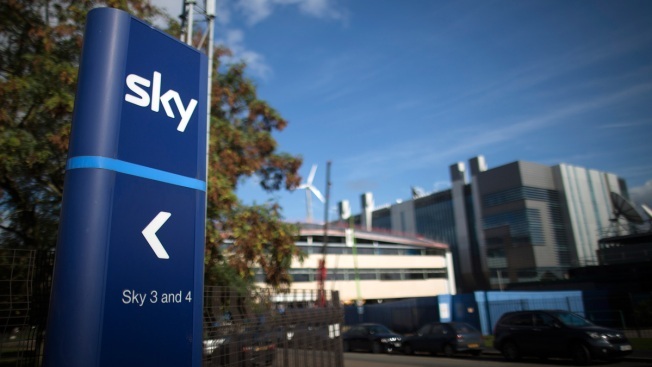 A logo sits on a sign outside British Sky Broadcasting Group Plc's (BSkyB) headquarters in London, U.K., on Friday, Oct. 4, 2013. Comcast, the owner of NBC and Universal Pictures, has launched a bid for British pay TV broadcaster Sky that threatens to thwart the takeover ambitions of media mogul Rupert Murdoch. The firm is offering 22.1 billion pounds ($29.50 billion) for Sky. The possible cash offer values each Sky share at 12.50 pounds per share, which represents a 16 percent premium to the bid from Murdoch's 21st Century Fox. Comcast Chief Executive Brian Roberts called Sky "an outstanding company" that would boost Comcast's global presence. "We think that Sky would be very valuable to us as we look to expand our presence internationally," he said. He noted that Comcast already has a strong presence in London and would use Sky as a "platform" for growth in Europe. Fox's bid to buy the 61 percent of Sky it does not already own has been slowed by regulatory problems in Britain. The primary problem is a preliminary finding by the Competition and Markets Authority that a Fox takeover would give the Murdoch family too much control of Britain's media. The competition authority last month raised concerns about Murdoch's power because his family trust already controls newspapers such as the Times and the Sun, and the deal would increase its control of the influential Sky News channel. Fox's bid for Sky is accompanied by a broader takeover offer for Fox from Walt Disney. So a Comcast takeover of Sky could complicate Disney's proposed takeover of Fox. Shares in Sky surged Tuesday after the announcement of Comcast's interest was made. Its share price jumped 19 percent to 13.10 pounds.